Mercedes-Benz introduced the GLC 63 models back in April at the New York Auto Show and now it’s opening the order books in its domestic market Germany where customers can purchase both the standard model and the “coupe-ified” version. The most attainable version money can buy starts off at €96,509 (about $108,000) for the non-S GLC 63 in the regular body style and rises to an eye-watering €117,096 ($131,100) for the limited-run GLC 63 S Coupe Edition 1. 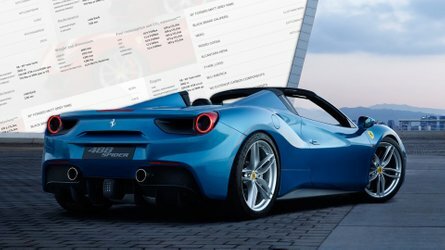 Looking at the company’s German configurator, the most expensive version of the bunch costs just as much as the GLE 63 Coupe in the non-S specification: €117,155 ($131,200). While the Edition 1 available for only 12 months does have a few extra niceties to try and justify the premium, it’s hard to make a case for it considering for the same amount of money you could buy the bigger and more powerful GLE 63 Coupe. The limited-run special version gets the Night and Aero packages as standard equipment along with matte black 21-inch forged wheels. On the inside, the range topper has black Nappa leather for the sports seats, a matte carbon fiber and bright aluminum trim, as well as yellow contrast stitching together with other similar trinkets. In the United States, the new GLC 63 and GLC 63 Coupe models will arrive at the beginning of 2018. In related news, Mercedes is now also accepting orders for the E-Class Cabriolet originally shown at the Geneva Motor Show in March. The lavish droptop can be had in Deutschland in E220d, E350d 4Matic, E200, E300, and E400 4Matic flavors. The cheapest one is the gasoline-powered E200 from €54,228 ($60,700) while the most expensive version upon launch is the all-paw E400 beginning at €70,281 ($78,700). The U.S.-spec E-Class Cabriolet is expected to land towards the end of the year and should cost somewhere in the region of $65,000, which will be a tad bit more than the base $62,600 outgoing model. Note: Raw conversion from euros to U.S. dollars. Does not take into account differences in tax. Stuttgart/Affalterbach. 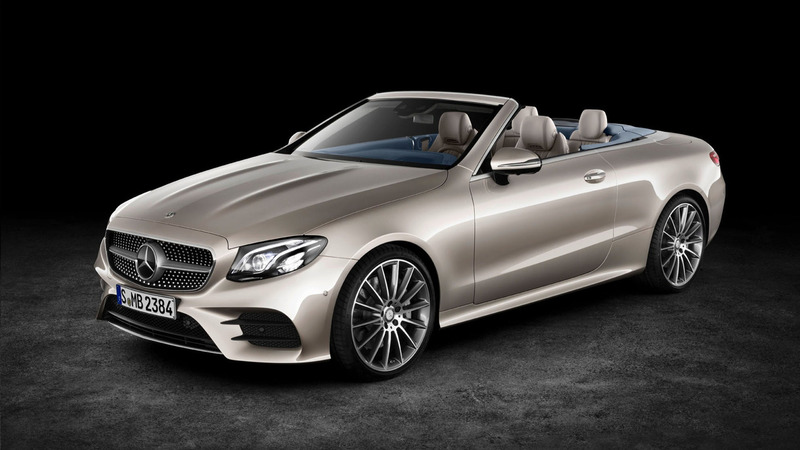 Mercedes-Benz is completing its E-Class family with the new E-Class Cabriolet. This open four-seater with a classic fabric soft top combines puristic, sensuous design with high long-distance comfort for four occupants and the latest technology. The new E-Class Cabriolet can be ordered now, with prices starting from 54,228.30 euros. 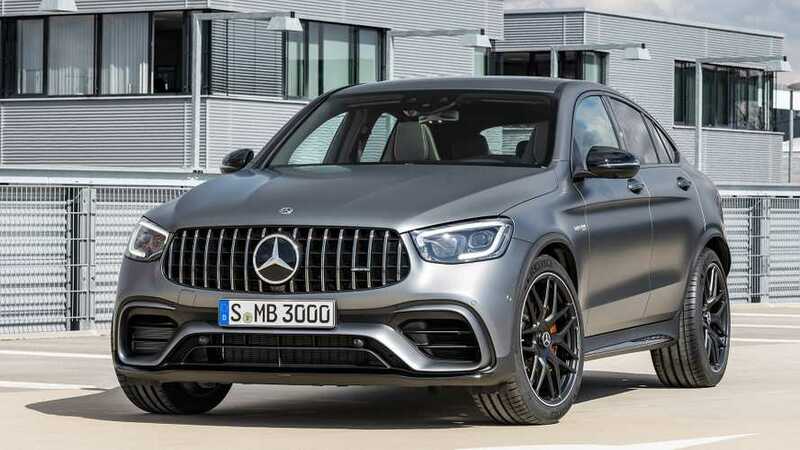 At the same time Mercedes-AMG is extending its model range to include four new Mercedes‑AMG GLC 63 models (fuel consumption combined: 10.7-10.3 l/100 km; combined CO2 emissions: 244-234 g/km). These mid-size performance SUVs combine hallmark AMG effortlessly superior output with the advantages of a Mercedes-Benz SUV. Prices start at 82,705.00 euros. 1 All prices: recomm. retail price in Germany incl. 19% VAT. 2 NEDC combined. E 350 d 4MATIC sales release (fuel consumption combined: 6.5 l/100 km; combined CO2 emissions: 170 g/km) in mid-July. The technical highlights of the new E-Class Cabriolet include comprehensive smartphone integration with a wireless charging and key function, a Widescreen Cockpit and the latest assistance systems of the E‑Class. The E‑Class Cabriolet is also available for the first time with 4MATIC all-wheel drive, and AIR BODY CONTROL multi-chamber air suspension, as already seen on the E‑Class Saloon. The standard-fit fully automatic acoustic fabric soft top is available in the colours dark brown, dark blue, red or black. 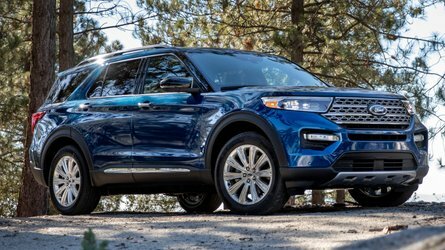 Its multi-layer structure with sophisticated insulation makes it easy for the occupants to hear each other talk, even when driving at high speed, and offers high levels of climate comfort. This helps make the cabriolet suitable for use all year round. On request the Cabriolet can be equipped with the AIRCAP electric draught-stop system and the AIRSCARF neck-level heating system – to enhance comfort when driving with the roof down. To coincide the with market launch Mercedes-Benz is also offering the E‑Class Cabriolet as a 25th Anniversary Edition, recalling the start of the E‑Class Cabriolet´s journey 25 years ago. 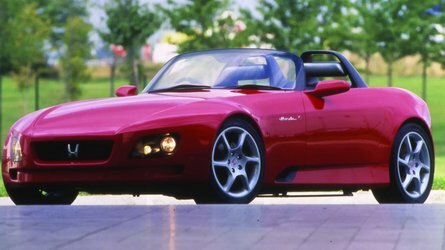 Painted in rubellite red or iridium silver, combined with a dark red acoustic fabric soft top, the Edition models radiate refined sportiness. With seats in designo nappa leather with diamond quilting in macchiato beige the interior offers a high equipment specification. The on-board features include the adaptive windscreen washer system MAGIC VISION CONTROL, the Cabriolet Comfort package with AIRSCARF neck-level heating and the automatic draught-stop system AIRCAP plus a fully automatic boot separator. The standard specification also includes 5‑twin-spoke 20‑inch light-alloy wheels and the AIR-BALANCE package with its specially created fragrance DAYBREAK MOOD. "25th Anniversary" badges on the wings and on the centre console identify these limited special edition cars. 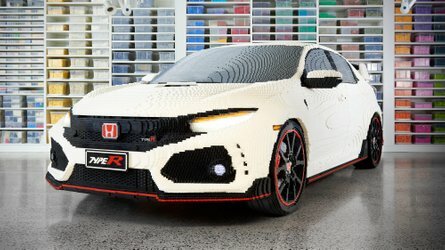 The additional cost for the special models is 11,305 or 12,138 euros incl. VAT, depending on the entry-level model. All prices: recomm. retail price in Germany incl. 19% VAT. 2 NEDC combined. 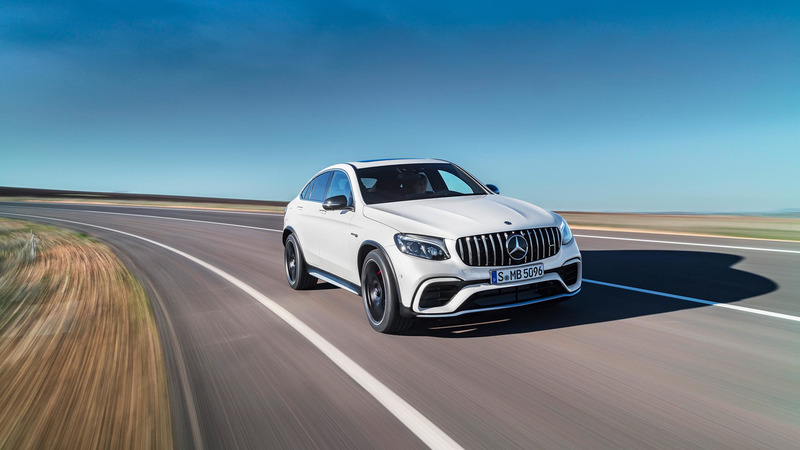 The new Mercedes-AMG GLC 63 4MATIC+ SUV and Coupé models (fuel consumption combined: 10.7-10.3 l/100 km; combined CO2 emissions: 244-234 g/km) plus the new Mercedes-AMG GLC 63 S 4MATIC+ SUV and Coupé models (fuel consumption combined: 10.7 l/100 km; CO2 emissions (combined): 244 g/km) are the only cars offered in the segment to be equipped with an eight-cylinder biturbo engine and thus also offer effortlessly superior output as mid-size performance SUVs. At the same time they set new standards with their air suspension with adaptive damping adjustment, the AMG performance all-wheel drive system 4MATIC+ with fully variable torque distribution, the rear axle differential lock and the high-performance braking system. The AMG SPEEDSHIFT MCT 9‑speed transmission is also used. As a visual indication of their links with Mercedes-AMG sports cars, the new models sport the AMG Panamericana grille, which was previously reserved for the AMG GT family. 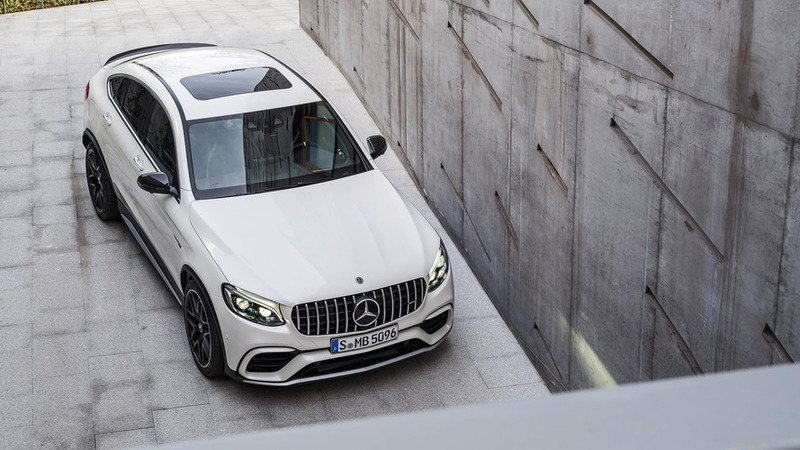 The SUV and Coupé variants of the Mercedes-AMG GLC 63 4MATIC+ and GLC 63 S 4MATIC+ are also available at market launch as an "Edition 1" special model: the exclusive combination of equipment details turn the special model into the flagship of the range. In both body variants, the Night package in high-gloss black enhances the racing-inspired looks. The sports stripes on the sides of the vehicle are in yellow or matt graphite grey, depending on the paint colour and model variant. the matt black 21‑inch cross-spoke forged wheels are provided with highlights in the form of yellow or high-sheen rim flanges. The Aerodynamics package, too, draws its inspiration from the world of motor sport. 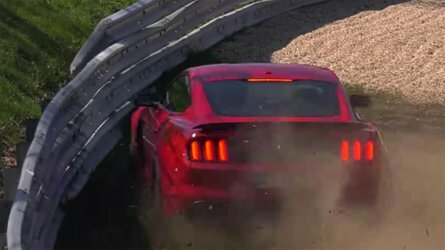 The racing feel is carried over into the interior. The sports seats are upholstered in black nappa leather and reprise the colour yellow in the contrasting topstitching of the specific diamond pattern. Black nappa leather with yellow contrasting topstitching also enhances the door centre panels, armrests and centre console. Further yellow highlights adorn the instrument cluster, floor mats and Performance steering wheel with flattened bottom section in DINAMICA microfibre with 12 o'clock marking. Added to this is AMG trim in matt carbon fibre / bright aluminium with longitudinal grain. Exclusive to the Edition 1 special model is the AMG Performance seat with diamond design and contrasting topstitching in yellow (standard in the S‑Model with a corresponding exterior).